Some old sayings are time tested, and that’s one of them. And when it comes to keeping your RV on the road, a little maintenance will save you lots of time and money in repairs. No need to feel overwhelmed at the idea though, your RV can be simply thought of as a combination of a vehicle and a house. So for many of you, things like simple mechanical maintenance along with DIY plumbing, electrical, and other “home improvement” fixes will come naturally. And for those of you who are less comfortable with your skills, relax, a little confidence, patience, and a youtube.com instructional video or repair manual will be all that is needed. For RV repair & maintenance beyond your capabilities, there are numerous reliable RV repair shops and dealerships that can solve just about any problem. 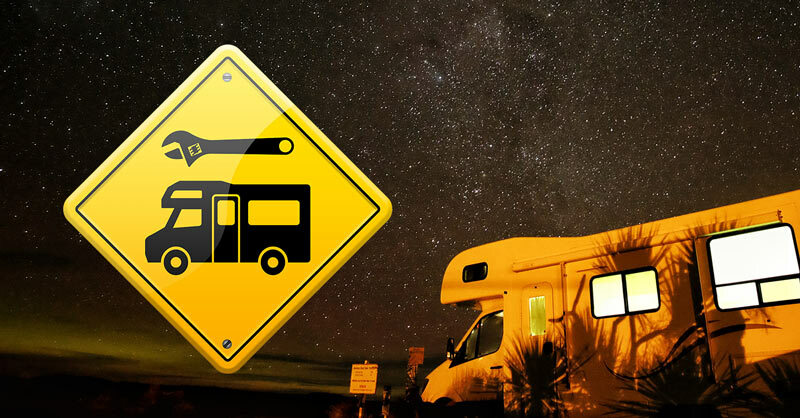 To get a better idea of what kind of mechanical problems might present themselves depends on whether or not you have a motorized RV (Motorhome) or a towable RV like a travel trailer or fifth wheel. With motorized RVs, there are crucial mechanical components like the motor and transmission. Many motorized RVs are powered by diesel motors which may be a bit foreign to the average person, but with a little education, can be just as simple to work on as a gasoline engine. The same goes for the vehicles used for towing RVs; proper maintenance will keep them doing their job and you out of Becoming Clark Griswold stranded with your family at some backwater mechanic shop out of National Lampoon’s Vacation. For both types of RVs, some maintenance is just plain common sense, like keeping tires at the right pressure and making sure they are in good shape. As well lights and turn signals should be working at all times, and often only a few screws and a bulb are needed for such a fix. Batteries are also very important and can be a bit tricky in RVs if you are not up to speed on them. There are a few different types found in RVs, such as Engine Starting batteries which in motorized RVs do the same basic function that they do in your car or truck. More powerful versions like Marine batteries are sometimes used as well. Then there are the Deep Cycle/RV batteries which are meant to supply smaller amounts of current for long periods without being recharged by an alternator like an Engine Starting Battery. These will supply the power for your living space needs. Sometimes mechanical problems occur which are beyond your powers to fix and at these times, doing some research to find a reputable repair facility will pay out in the long run. Maintenance and repairs are also often necessary for the interior and exterior of your RV. In most cases, a little know-how in the fields of plumbing, electrical, and home remodeling can be learned on the fly with an instructional video or manual. If you are nearby or have access to a big box chain like Home Depot or a small local hardware store, an associate can often help you get on the right track. If you’ve ever installed a toilet or faucet in your home, you can probably do the same in your RV. Because of weight and cost considerations in the manufacturing and design process, many RV parts and components are more likely to wear out faster than the same type of item in your brick and mortar home, making maintenance on these items of the utmost importance. By following some simple RV maintenance practices, you are bound to go further down the road without having to make any unnecessary stops along your adventure for repairs and in the process save some of your hard-earned money for more important things like souvenirs, post cards, and a drink at a yet to be discovered roadhouse.